OCCC Safety and Security is considering adding an earthquake alert to the college’s IP phone system after the Oklahoma Geological Society confirmed a 4.7 magnitude earthquake that shook OCCC as well as much of the state at about 9:06 a.m. Oct. 13. Safety and Security Coordinator Keith Bourque said no alert was sent over campus telephones after the earthquake because currently, there is no earthquake alert in place. “After this event, we’re probably going to look into creating one,” Bourque said. He wasn’t the only one taken by surprise. Jeff Simpson, English professor, said he was upstairs when the building shook. Sociology major Tonya Magama said she was in her English Composition I class when the earthquake struck. Political science major Mickey Morgan said he was unaware of the quake until he received a text message from a friend in Tulsa. “I changed my Facebook status after that,” Morgan said. President Paul Sechrist said in an e-mail that no damage has been reported at OCCC. “While the event may have been a little unnerving, we have no reports of damage,” Sechrist said. 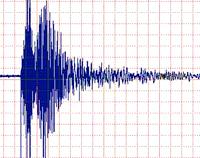 An employee with News 9 said callers from south Oklahoma City to Tulsa have reported the quake. According to the United States Geological Society, significant earthquakes in Oklahoma are uncommon. An earthquake registering more than 4.0 on the Richter scale has not been reported since May 2, 1969, according to the USGS. The largest earthquake in Oklahoma history occurred near El Reno in 1952. The 5.5 quake caused minor damage and injured two people.